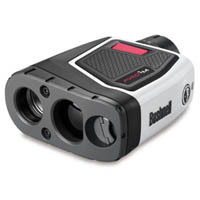 This top of the line model from Bushnell has more ability in distance to the flag than almost any other rangefinder out there at 550 yards and a whole mile for other measurements. It also has enhanced accuracy and displays yardages in a vivid easy to see red OLED light display. It’s a bit large and heavy though. Hope that you don’t need repair on your Bushnell. My contact button stopped working and when I sent it in for repair it took Bushnell over a month and $150 to repair the rangefinder. I felt like I was being hosed.